From Mantova hut climb up the glacier up to the Gnifetti hut (3647 m). You go around it on the right on not steep slopes and you reach a flat area with any crevasse (pay attention during the hottest hours). 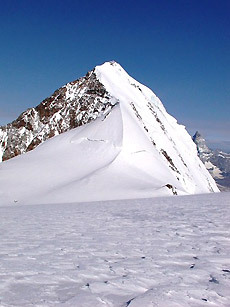 You climb up the Lys glacier first diagonally on the left, along a steep slope, than you continue on more moderate slopes, another area with large and treacherous crevasses, pointing to the Lys Pass and leaving the Balmenhorn on the right. To go down through the most steep and icy stretches you can use some other screws to be more safety. Pay attention to the consistency of the snow on the top (especially in warm weather when it melts very quickly) and to the possibility of ice at the bottom.